It could have been just another lame ribbon-cutting ceremony. There was a proclamation signed by the Mayor and the San Diego City Council that declared Feb. 16th as “EvoNexus Downtown Day.” There were speeches, and Mayor Jerry Sanders and the VIPs crowded together with a pair of oversized scissors to snip a ribbon. But something else was present as well. Last night’s official opening of the downtown EvoNexus, an incubator for Internet software and mobile app startups, drew more than 200 people, and many seemed to be infused with a fresh sense of optimism that maybe, just maybe, a resurgence of local tech startups is underway here. A dozen “foundry” startups and one later-stage “forge” startup already have moved into the 15,000-square foot incubator—and there is room for six or seven more. “The vision is to create something close to San Francisco’s ‘South of Market’ area,” says Kevin Hell, the former DivX CEO who has been overseeing EvoNexus as the incubator’s volunteer chairman. That’s a bit of a stretch. San Francisco’s SoMa neighborhood is a hotbed for high tech startups, as well as the corporate home for such companies as Twitter, Dropbox, Yelp, CNET Networks, and Wired. 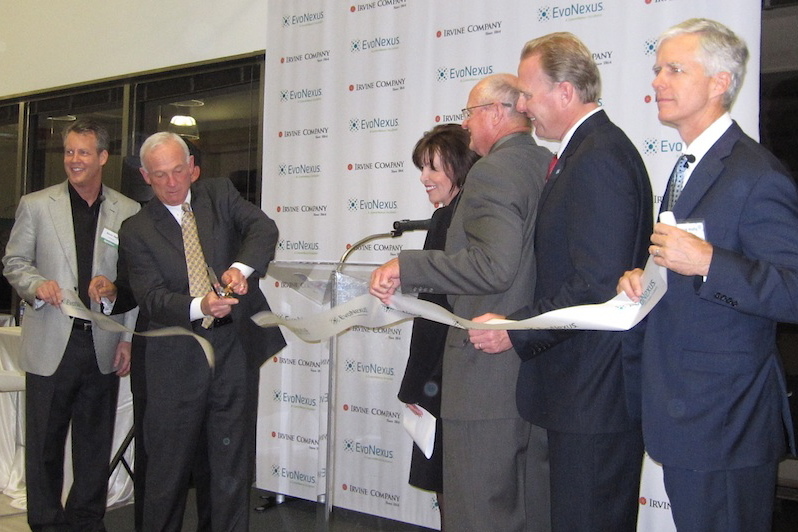 CommNexus, the non-profit industry group once known as the San Diego Telecom Council, established EvoNexus in the University City area in 2009 as a free startup incubator. The Irvine Co. has been providing the commercial office space at no cost (for both the downtown EvoNexus and in University City), and CommNexus is covering the utilities and other operating costs. Well written Bruce. Thanks for joining us.